A ‘dangerous’ convicted murderer, who has been on the run since Monday, was arrested by the PSNI late last night. Stephen Henry, who was jailed for murdering father-of-two John Cooke in Lisburn in 2004 with a Samurai sword, was arrested by police in Waringstown near Lurgan. 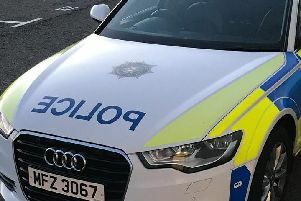 Police had warned the public not to approach the 41-year-old after he failed to return to Magilligan Prison on Monday under the conditions of a day release pass he had been given to visit family. Henry was last seen in the Craigavon area on Monday at around 3.45pm however it is understood he went to Dublin where he was arrested and had appeared in court. It is also believed there had been no European Arrest Warrant issued on Friday so he was released from custody. When Henry went missing earlier this week Detective Sergeant McColgan said: “We believe that Stephen Henry, who was jailed for murder in 2004, is dangerous and may be in either the Craigavon or Belfast area.